Congratulations to James, a Dulwich College Beijing student, who has become the first student from a high school in China to sign a scholarship offer to play National Collegiate Athletic Association (NCAA) Division 1 basketball in the US. This is substantial accomplishment; Division 1 is the highest level of intercollegiate athletics approved by the NCAA, who also state that only two-percent of high school athletes are awarded athletics scholarships to compete in college. Having signed his National Letter of Intent to the University of California, Berkeley, this past December, James’ parents, teachers, university counsellors and College leadership team gathered to celebrate his selection. James began his journey in Year 9 with the goal of becoming a varsity player at Dulwich College Beijing. Then followed Association of China and Mongolia International Schools (ACAMIS) title wins, Chinese Junior National Team selection and then the Men's Olympic National Team. 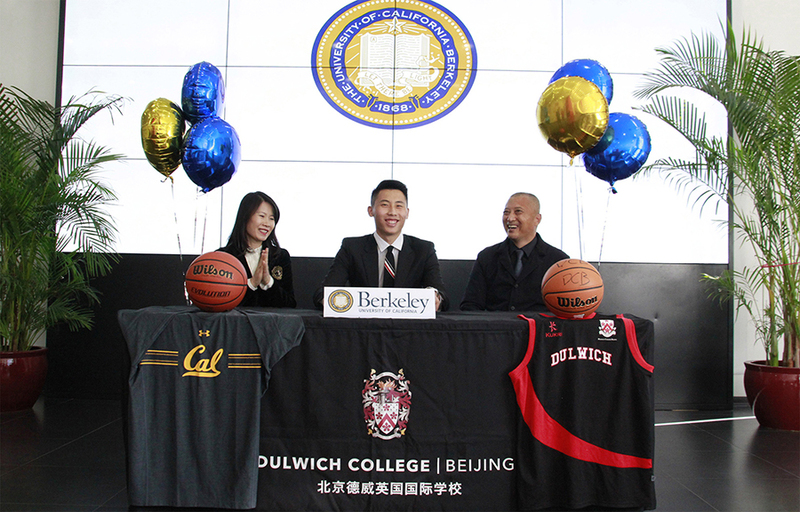 We wholeheartedly agree with Dulwich College Beijing university counsellor Kaersten Deeds, who commented that James "is going to make a great Cal Bear and we are proud to call him our own."